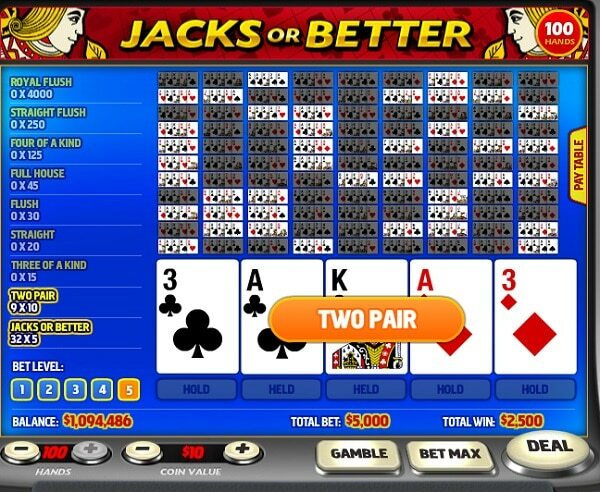 Video Poker is a fun interactive alternative to slot machines, and if you’re playing in a casino, you’re likely to get great some odds, as it has a low house edge. The game requires skill with a potential for some big wins. 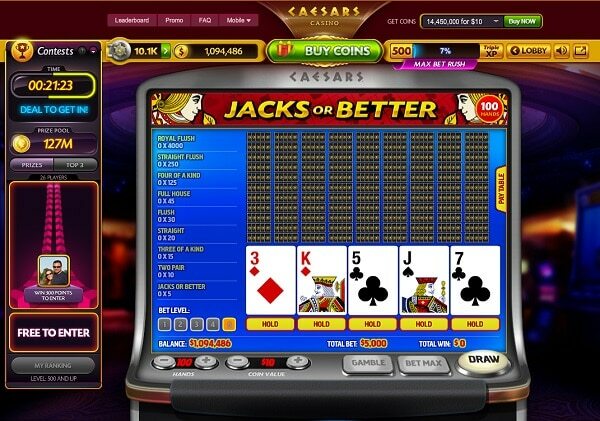 It was first introduced in the seventies and has been one of the most popular casino games ever since. In case you’ve never played Video Poker before, we’ll go over some of the rules that will assist you in getting started. In Video Poker, you’re able to enjoy the game with multiple poker hands. Your total bet is based on the number of hands you’re willing to play, your bet level and the coin value. Total bet = Coin value X Bet Level X number of hands. As your experience level goes up, the number of hands you’re able to play will go up as well, allowing you to place a higher total bet if you choose. Each type of winning hand is worth a certain amount, as indicated in the Paytable. Increasing your Bet Level will increase the potential amount for each winning hand accordingly. If you’re playing with more than one hand, your Total Win is the sum of all your winning hands. A hand is played in three stages: Deal, Draw and Gamble. The Gamble stage is optional and only activated when a hand has won. The game will begin as soon as you hit the “deal” button, which you will then be dealt five cards with the option to Hold any or all of them. Just tap or click the pictures on the screen or press the buttons on the console to determine which ones you want to keep. When you’re finished, press the “draw” button to be dealt new cards to replace the ones you discarded. You may choose to Hold none of the dealt cards, if you’d like. The five remaining cards will determine your win. If you’re playing more than one hand at a time, your win will be individually calculated per hand, and then added to the total win. Any cards that have the potential to win will be held automatically, but of course you can unselect the card(s) if you choose to. You win whenever you get a traditional poker hand such as two pair, a straight, a flush, etc. The amount that you win and the Video Poker odds depends partly on your bet and partly on the paytable of the video poker machine. If you have won any hands, you have the option to Gamble your wins. In order to win, you must guess the color or the suit of the card located at the top of the deck. If the color is correctly guessed, your win will be doubled, your win (X2) from the hand. However, if you guess the suit correctly, your win will quadruple (X4) from the hand. Assuming you have made the correct guess, you can continue to Gamble your win or just go ahead Collect. The last cards drawn from prior gambling rounds will be displayed. An incorrect guess will bring the total win from your hand. Speaking of the paytable, you’ll notice that the more coins you bet per hand, the bigger the returns, particularly as your winning hands improve. Always check the pay table to determine what your returns will be, and be sure to stick to a budget. And if you can’t afford to pay the cost of the maximum number of coins at a time to qualify for a jackpot, you might find it helpful to switch to a machine that takes lower-denominations. This way you can input the maximum bet and get better payouts than you would if you used lower bets on a machine that costs more per hand. The goal of Video Poker payouts is to get the highest ranked hand possible. Winning hands are ranked in the following order, from lowest to highest. If you’re new to poker, be sure to familiarize yourself with these hands before you start playing. Inside Straight: A straight with a single number missing in the middle, i.e. 4,5, J,7,8. Discarding the Jack opens you up to receiving a 6 and winning the hand. Note that inside straights aren’t worth worrying about when you’re playing Jacks or Better, as you get just once chance to fill in the missing piece. Jacks or Better – You get an extra point for every PAIR of J’s or higher. Deuces – The “2-wild” card is a kind of Joker/wild that substitutes for any card. A “Natural Royal Flush” is a Royal Flush that wasn’t won with the help of a wild, rather by the genuine winning cards. Now that you know a bit about video poker, it’s time to start practicing. 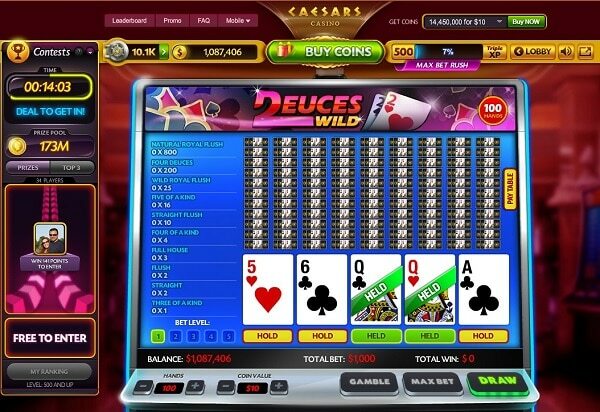 You can enjoy all the fun of video poker without risking any real money when you play socially with Caesars Casino. You’ll be able to test different strategies, familiarize yourself with traditional poker hands, and get plenty of practice before you visit a real, live casino. Whether you choose Jacks or Better or a different video poker game, be sure to play with winning in mind, but most importantly, have fun!